I have 2 ask..why r u in Egypt? I’ve read ur blog occassionally and for the most part, you don’t really enjoy or fit in with the culture or the predominant religion, Islam. Why would you stay somewhere that you consider somewhat racist? You spend most of the time with expats. It doesn’t make much sense. Seems like a fair question, though I’m intrigued by this notion that you should only live places you love, and immediately leave places you find you don’t love. Because how would we know how we’d really feel about living in Egypt until we moved here? Now here’s the long-winded answer. What brought us to Egypt was Africa, a real passion for learning more about this gigantic continent with the possibility of traveling to sub-Saharan Africa and especially Ethiopia and other parts of East Africa, which are not all that far away. And where both my kids were born. We brought them from Ethiopia to the US, and they inspired us to come back this way. What brought us here was a desire for our kids to feel at home in the world, to think of the world not from an exclusively American perspective but one informed by life beyond the States. What brought us here was a sense of adventure, of wanting to live and work outside of the US. And what brought us here was an interesting career opportunity for me (the boring part). All these things have worked out great. I’m fully immersed in the Middle East, of course, but also in Africa, and I have more opportunities to learn about and understand this continent than I ever would in the US. On a daily basis, I see and interact with Africans from all over the continent, not just Egypt but also Sudan, Ethiopia, and other countries. And the boys, I think, have really benefited, young as they are. Their school is incredibly international, and they are learning a lot about the world. Their classmates are Egyptian, Italian, American, Moroccan, Japanese, Ghanaian, and… the list goes on. And right now we are here because I have a two year contract. And, actually, I really enjoy my job, which I don’t write about because it’s not good blog fodder, and Mr. Four enjoys his lifestyle too. We can afford for him not to work (a luxury in the US for people in our income bracket), and we can afford household help (an even more amazing luxury). My work schedule here is about 35 hours/week, and I have generous holiday time in addition to six weeks of annual leave. I have so much more time with my kids here; it’ll be hard to go back to the US for this reason alone. Life is easy and good. We have faced some challenges we didn’t expect. 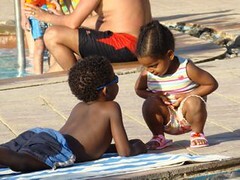 I was warned about racism in Egypt, but coming from the US (with its own problems with racism, you might have heard), it was hard to understand how that would play out for our family. It’s been a disappointment. I also didn’t realize how utterly confusing our family would be to many Egyptians (though I hasten to add there are plenty here who do get us). Despite occasional angst, the problems, we’ve decided, don’t merit breaking my contract, which would likely cost us lots of money in moving expenses back to the US, as well as major professional issues for me. And the longer we’re here, the more we like. Lots of people live in places they don’t love for very mundane reasons. And, there are many, many Cairenes who don’t love Cairo at all. In fact, many Egyptians here apologize for Cairo! As if some of the problems of living here are their fault individually. My concerns about Cairo are voiced by many others, Egyptians and expats. And there are plenty of expats who are only here for the money (and not just oil families). That’s not us by a long shot. We do spend a lot of time with expats. As a friend observes, just like Egyptian immigrants to the US spend a lot of time with Egyptians and other Arabic-speakers. This is not an unusual phenomenon, to spend time with people who speak the same language and have the same culture. Our community here is American but also international, and the expat community is great. Despite all this, we have become friendly with some Egyptian families (including some who have invited us over for dinner this weekend), and I have some wonderful Egyptian colleagues at work. Mostly, though, we hang out as a family. It’s a romantic and misguided notion to think that if you move to a new country, the locals will rush to befriend you. That doesn’t happen so much in places like Cairo, with something like 40,000 Americans and 100,000 expats. It’s true that I don’t have a particular adoration for Egyptian or Arab culture (though I do find Arabic fascinating and I love Egyptian food). But I didn’t know any of this until I got here. I don’t have a particular interest in Islam, though it’s been great to learn about Islam from my Muslim friends and colleagues. I love, for example, hearing the call for prayer five times a day. I love seeing the Nile River on my afternoon commute, and, on rare clear days like today, the Great Pyramids in the distance. Our reasons for moving here, and then staying, are complex. What is simple is this: moving here was a great decision, and I’m so glad we’re here. This year I’ve been focusing my reading on African authors, particularly sub-Saharan African. So I was delighted today to learn, courtesy of Andrew at Meskel Square, about the Africa Reading Challenge, sponsored by … some guy with a blog. The idea is to read, in 2008, six books “that either were written by African writers, take place in Africa, or deal significantly with Africans and African issues” and then write a blog post with a review of each. I read Adichie’s Half a Yellow Sun a few weeks ago, and it was incredible, so I look forward to her other book. Of course I’m especially interested in Ethiopia, so Haile’s book should be great. Mahfouz’s book is a choice because I really should read some more Egyptian writers. Mandela’s autobiography is supposed to be great. And the last couple were semi-random picks. Join me, if you are so inclined. Today, while Mr. Four stayed home to catch up on some missed sleep from a very early morning with Bug, I took Bug and Giggle out for some swim and play time. Usually when we take a taxi, I sit in the back with the boys (car seats are not part of life here in Egypt, so the three of us fit easily). Today, I had so much stuff I decided to sit up front while the boys sat in the back. Perhaps this encouraged the taxi driver to be extra chatty (usually the conversation isn’t much more than a hello and how are you, if that). He didn’t ask anything else. I’m sure that was all clear as mud to him, eh? 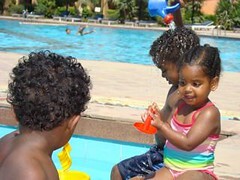 Who knew that pale skinned parents could have brown skinned children if they’re born at the right moment? Apparently, some Egyptians know this. I did not. The other moral of this story is thank goodness for Maya’s family. We’d be lost in Egypt without them. A few weeks ago, when we went to Wadi Digla, we apparently left the door of our apartment ajar. It was wide open when we got home, with nothing amiss… except no cat. We posted signs around the building, only to hear her mewing in the stairway, a few floors up, a couple of days later. We suspect she wandered out exploring and got confused since all the floors look the same. She was hungry and tired but otherwise seemed fine. All was well until last week. As we were leaving for the beach, we couldn’t find her again. This time we wonder if it’s intentional. Maybe she escaped our house to escape the pup? Our Ethiopian housekeeper/nanny/maid (some Cairenes use the term “servant” which just sounds all sorta wrong to me) cooks for us most week nights, and often she makes Ethiopian food. Dinner usually includes misr wot (red lentils), misr alicha (less spicy lentils), and a vegetable dish or two like gomen (greens), cabbage, potatoes, or green beans. Every other week or so we have doro wot, basically chicken stew, which is a bit more complicated because the recipe includes something like a dozen onions. I love it all, and I love that it’s vegetarian and cheap and keeps the boys connected to their home country. We don’t know of any teff available locally, so we substitute regular whole wheat bread or pita-like local bread for injera, the pancake-like flat bread served under the main dishes. By the way, the word “misr” in Arabic means Egypt. So to an Egyptian, it might sound like we’re eating Spicy Egypt. Yum, what a dish. Anyway, this month the foodie magazine Saveur is featuring Ethiopian food. I was excited for new recipes when I realized all but one of their recipes are a regular part of our diet. We had a great weekend at the beach with our friends Cindy, Mike, and Maya. Courtesy of Mike, we also already have some great photos. He managed to download them and send them along while ours are still in the camera. 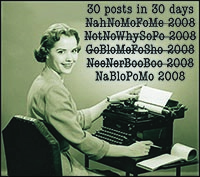 And, he said I could blog with them. So, here you go. It was hot in Cairo, but a bit cooler at the beach. The water in the pool, however, was really cold. 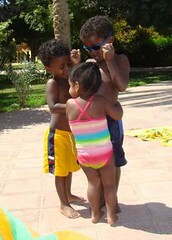 So the kids spent as much time outside of the water as in it. They had a great time with the cheapy plastic beach toys bought at the hotel gift shop. The kids all really like each other, and, for the most part, get along really well, especially considering the age range of Maya (2 years old) to Giggle (5 years old). 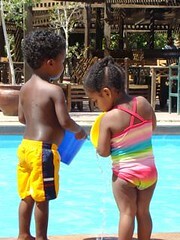 Here are Maya and Bug with their buckets at the kiddie pool. Giggle, as the oldest, was the trailblazer of cool. After he swam in the very cold water, he’d lay out in the sun on his blanket. Here’s Maya, chatting him up. 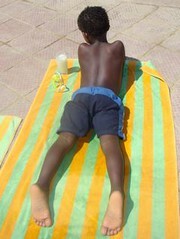 Giggle really got the hang of sun worshipping; note the lemon juice on his blanket. And of course Bug and Maya followed suit. In a few days, I’ll download our photos (which won’t be nearly as good) and share some more. I should clarify that, yes, indeed, I am showing Maya’s face in these photos when I don’t really share my kids’ own pretty faces. Mike and Cindy gave me explicit permission to do so. Which means you get to enjoy an actual human face. And a cute one at that. In my defense, I had no idea it was 5 am. I just knew it was too early for me to get up. I have been sick, after all, and getting up once or twice a night to deal with a crying puppy. And, I do feel much better today. Because he had so much time this morning, Mr. Four made strawberry-banana bread and banana bread for the trip. Yum. The lesson from today is that it’s great not to rush out the door for a weekend trip. Usually we’d leave after work, having packed the night before. We packed last night and are leaving late morning (in about an hour as I write this), which I hope means the boys will sleep in the car and we’ll arrive at the hotel at check-in time, with a whole afternoon for the pool and sea. And reading. And breathing clean air. Of course, we’ll also be following basketball. You can take the girl out of the states, but you can’t take the March Madness out of the girl. Or something like that. Have a great weekend, dear readers. Thursday is a holiday called Mawled El Nabawi, the birthday of Mohamed (you know, the Prophet). And Sunday is the western Easter (can’t call it just “Easter” here because the Coptic and Ethiopian Orthodox Christians celebrate Easter next month). This means we have a four-day weekend starting tomorrow, perfect for a trip to the Red Sea, just a couple of hours east of Cairo. We’re trying a new hotel that apparently has two pools and a lovely beach. That’s pretty much all we need. The forecast this weekend is ridiculous: highs in the low to high 90s, peaking at 100 on Sunday (this after the past two weeks in the 60s and 70s). Yes, 100 degrees. I will hide in the shade and read while the boys frolic. I’ve been either sick with a cold or some nasty allergies (either no doubt exacerbated by the pollution), so I’m looking forward to a weekend where I can relax and the boys can play like mad. We’re also delighted that some friends are joining us there. Our housekeeper/nanny is going to take care of the pup and our kitty (who wonders why we hate her so much that we brought a dog into the house; the dog, in the meantime, seems not to have noticed the cat despite her constant stalking of him). Tonight I pack and take the pup back to the vet for another check-up. I also just realized that I should probably put together some semblance of an Easter basket for each of the boys. That’s the tough thing about adopting older kids: you don’t ease into these holidays slowly, but, bam, here’s a 5 year old wanting some candy. Maybe we’ll pack it and hide it at home for the boys to find when we get back. So we’re off for a few days. In the meantime, let me know how you’re spending your weekend. My friend Cindy tagged me, so here’s the post in response to her. 1. I grew up in a house right on a lake. I thought it was really strange when we moved and we had a regular yard and no lake. 2. Sometimes I really love celebrity gossip. I’ve cut back lately. 3. My first real job was in a Hallmark store. 4. I used to be a whitewater kayak instructor. And before that, a raft guide. Because I’m not what you’d call an athletically inclined individual, being a decent paddling instructor pretty much ranks as one of my top life accomplishments. 5. I adore cream soda. 6. My nose is just like my (French Canadian) grandfather’s. And an awful lot like the noses on my dad and uncle. 7. I think almost every dog in the world looks like my old dog, Ms. Underfoot. 8. I lived in the south for a few years before I tried sweet tea, and then only at the behest of a very attractive young man. I tried a sip and thought, “Sweet tea, where have you been all my life?” When I worked at the whitewater company, I went through a couple of years where I sucked down super sweet tea like it was water. The past year or so I’ve been on a diet Coke kick. Very bad. But I’m pretty much off the diet Coke now, since I read this article in the New York Times. I’ve been off the sweet tea for a few years. 9. I’m always full of ideas but very rarely full of the energy required to implement them. 10. A few years ago I was accepted into, and almost began, a doctoral program in English Lit. Not attending turns out to have been an excellent decision. Lulu’s Bay: I’ve just started following this blog of a fellow expat in Cairo, and I suspect Lulu isn’t the kind for this sort of silliness, but I’d be very interested in her responses. Jenni at the Fugate Family: A great writer and sure to have something interesting to say. Rock to Wind a String Around: ‘Cause she’s funny. Lenore stops by a lot. I’d like to know some random things about her. Cairogal is a new commenter ’round these parts. The pup is doing much better. Turns out he loves whole milk. It makes him run around and walk into walls. And he loves canned puppy food. It makes him chew the dish. 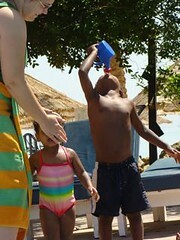 And he’s drinking water on his own now, too. Water doesn’t make him do anything, though. He can finally stand up again. He’s not regained all his coordination, so he wanders the house drunkenly, though with some purpose. He likes to be near people–he must miss his litter mates. Speaking of Bug… Bug LOVES the puppy. Giggle wants to take care of him and do the adult things, like get his food ready. Bug wants to nuzzle and cuddle him, which is turning Mr. Four’s heart to pudding.